The robot producer Mobile Industrial Robots, based in Odense, Denmark, has been purchased by Teradyne from the USA, for a price of 1.7 billion DKK, or over £200 million. This is good news not only for MiR, but also for Denmark and for the development of robots in general. 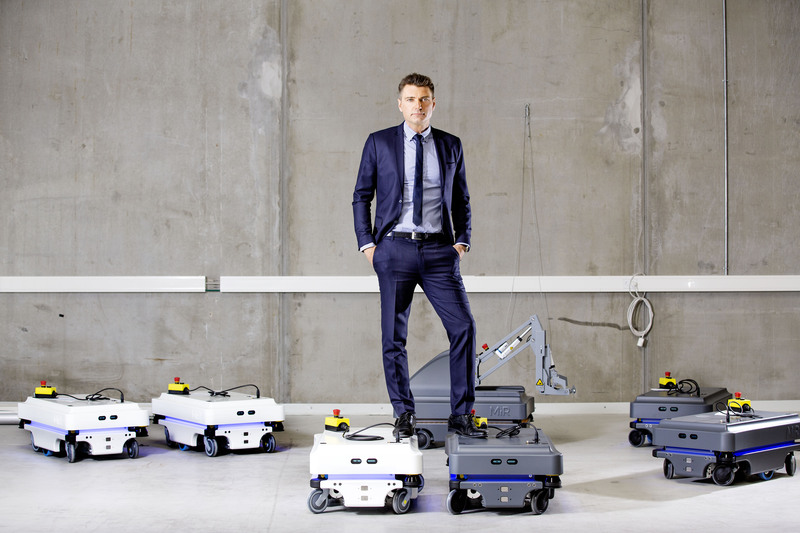 This is not the first time that Teradyne has purchased a robotics company in Odense. In 2015, Teradyne purchased Universal Robots, known for its collaborative robotic arm – or cobot – for 1.9 billion DKK plus performance bonuses. This history has shown us that a Teradyne purchase boosts innovation, growth, exports, and job creation in the purchased company. When huge exit payments land in the pockets of key persons and actors in the Danish robotics hub, a ripple effect is created. During the relatively short period of robotic development in Odense, the common thread has been increased investments in existing companies and reinvesting in new companies, which continues to strengthen the robotics hub here (see the infographic below for more). “Teradyne’s acquisition of MiR confirms that MiR has created impressive growth and a high value in just a few short years. At the same time we have already seen with Universal Robots that the jobs stay here in the country, and that the money from the buyout will be used for reinvesting in new, potential successes in the flourishing Danish robotics hub. In other words, we do not need to fear sales to international owners. Exits create a breeding ground for new promising startups, which develop first-class robot technology and create lots of new jobs in Denmark while increasing exports. And I expect that we will come to see even more Danish robot successes like MiR” predicts Esben Østergaard, the founder of Universal Robots. Currently in Denmark, there are three times as many robots in the workplace, compared to the global average. For every 10,000 workers in Denmark, there are 211 robots. The global average is 74 robots per 10,000 workers, according to the International Federation of Robotics. Embracement of robot technology in Denmark is largely due to the practical Danish design of robots for use in a typical Danish workplace. The Danish health care sector also incorporates Danish-developed robot technology to a larger extent. Another factor that has been beneficial to the development of robots in Denmark stems from a start-of-the-century political agenda: reshoring. “Reshoring” is the taking back of production jobs from low-wage countries, so that these jobs return to companies in the Western world. The flexible cobot plays the starring role in reshoring, because its technology unleashes competitiveness in Danish production. 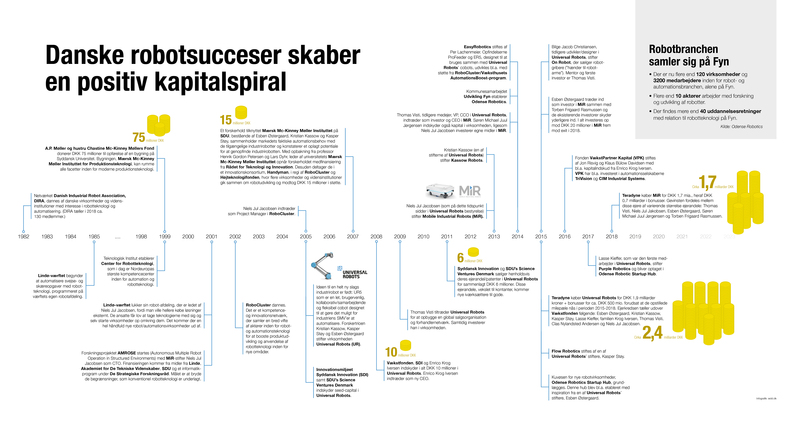 Here is the timeline of some of the essential key events in the creation of a successful robotics cluster in Denmark.